When it rains it pours, and right now it’s raining injuries in Cleveland. The Indians placed both Danny Salazar and Andrew Miller on the 10-day DL on Tuesday, as their vaunted pitching staff takes a serious hit. For both Salazar and Miller, it is the second trip to the DL this season. Miller being put on the DL was expected after the lefty took himself out of Monday’s game after just seven pitches. It was just his second outing since returning from a stint on the DL with patellar tendonitis in his right knee. Indians manager Terry Francona says the team has reached out to the Cleveland Cavaliers for help in figuring out the best treatment for Miller, noting that Miller’s injury is more common among NBA players. Miller spent a little over two weeks on the DL earlier this month. But clearly that was not enough time for him to fully recover. While his performance has dipped a little over the past two months, he remains one of the most dominant relievers in baseball. Much of Cleveland’s bullpen revolves around Miller, making him integral to the Indians making another World Series run this season. Meanwhile, Salazar’s trip to the DL with elbow inflammation is a little more unexpected, but not a huge surprise. He reported stiffness in his elbow while throwing a side session on Tuesday. Afterward, the Indians were quick to place him on the DL and schedule him for an MRI. It’s unclear at this time how long he’ll be on the DL. Salazar missed more than six weeks earlier this season with shoulder soreness. He’s also coming off his worst outing of the season. Sunday against the Royals, Salazar gave up six runs on 12 hits over 4.2 innings. However, until his most recent start, Salazar had begun to reassert himself as one of Cleveland’s most important starters. 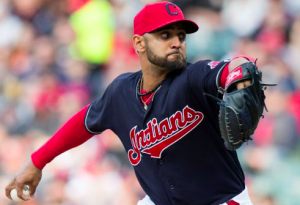 A healthy and effective Salazar alongside Corey Kluber and Carlos Carrasco could have given the Indians a better playoff rotation than the one that helped get them to the World Series a year ago. But uncertainty regarding Salazar’s health changes things for Cleveland’s rotation moving forward. With Trevor Bauer having an outstanding August and Josh Tomlin expected back from the DL within the next week, the Indians should have enough rotation depth to survive without Salazar for the immediate future. Cleveland began Tuesday with a 5.5-game lead atop the AL Central. Despite a recent string of injuries, the Indians should be able to hold off both the Twins and Royals for the division title. That being said, both Miller and Salazar will be important to Cleveland’s postseason success. Right now, there’s no reason to think both won’t recover in time to rejoin the team by the end of September. But if the Indians enter the playoffs without either healthy and available, it will hinder their chances of winning a second straight American League pennant.